Our workshops and classes give you practical information to help you find a new job. You can register online or download a PDF calendar. Join staff from our Enhanced Services team who will take attendees through the basics of workplace and professional disclosure as a tool for creating a positive workplace experience. This workshop will include practical tips for job seekers, suggestions around what to consider, an in-depth discussion around best practices for making an accommodation request, and other helpful ideas to build an effective accommodation plan. Learn about the Federal, Provincial, Municipal programs and frameworks. Find out more about mandatory contributions, eligibility, entitlements, Old Age Security benefits and GAINS. Bring your questions as we discuss how these income support programs relate to age, immigration status and provincial income supports for low income people. 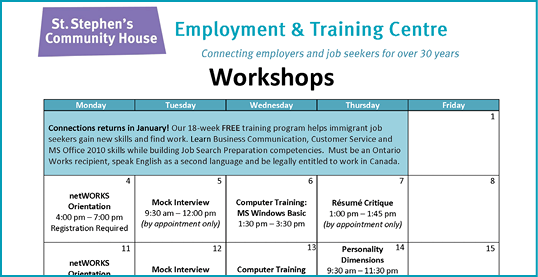 We offer classes on computer basics like Windows, MS Word, MS Excel, Internet, Email, and On-line Job searches. For these classes and for more advanced training, please contact Nafiseh Ahmadi at anafiseh@sschto.ca or 416-925-2103 x4232. In this interactive workshop, you will learn how the interview process works and practice with sample interview questions. This one-on-one mock interview with an Employment Advisor/Job Developer will help you practice and will give you informative tips and suggestions to improve your interview skills. This session is by appointment only. Learn how to network and get connected with professionals who will give you real-world advice, tips on how and where to look for jobs, and introduce you to other people in their own networks. This program is for youth, 18-29 years old. Refreshments and snacks are provided. You must pre-register by contacting Valerie at lvalerie@sschto.ca or Erika at ferika@sschto.ca. If you are thinking of making a career change, identifying your personal goals and vocational interests through self-assessment tools with help. After the workshop, you will access to an Employment Advisor to discuss options and next steps. This interactive session will teach job seekers the skills to become more effective communicators at work, as well as how to lead solution focused discussions in a variety of employment settings. Whether you’re looking for a new career or you want to improve the one you already have, this workshop is for you. Embrace your existing skills, values, interests, strengths and clarify your job objective and goals, through this engaging career development workshop. Leave equipped with new tools to empower you to reinvent yourself and achieve your employment goals. In this workshop, you will learn skills and techniques for treating yourself with care and compassion. Come out feeling refreshed and relaxed and ready to take on your job search! This workshop will introduce job seekers to social media as a tool for effective networking. Participants will also learn how social media can assist in career development, help them make connections to other professionals and find employment leads. Participants will also discuss the professional use of social media and develop a mock LinkedIn Summary. Learn why resumes are constantly changing and how you can tailor your resume for success. Leave with a variety of techniques to market yourself when searching for work. This session covers our three programs help youth, age 15 to 30, who are not-in-school or working to gain skills and plan their careers. The programs provide paid training and work placements. For details about the times of our workshops, please see our schedule. For more information, please contact us and start using our free services: We're a five minute walk from St. Clair West subway station. Our workshops give you practical information to help you find a new job.